February 12 – Nice work if you can get it. Jose Mourinho may be out of a management job at club level but he is rarely out of the limelight. The former Real Madrid and Manchester United boss has landed a plum mega-million role with English-language Russian broadcaster RT. The charismatic Portuguese reportedly earned a staggering £1.7 million working for RT during the World Cup and has now been given his own biweekly show focusing on the Champions League starting on March 7 with the station, formerly known as Russia Today. Mourinho, 56, was sacked by Manchester United in December after two years at the Old Trafford club and in a promotional video commented: “I wanted a new challenge… I’m used to surprising people”. 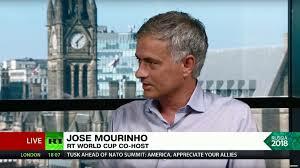 His new show on the Russian state-funded broadcaster is called On the Touchline with José Mourinho.